We’d love your help. Let us know what’s wrong with this preview of The Celestine Sword by M.E. Cunningham. Zach Marriott will now take his rightful place as the last and only Ancient in the land of Terratir… or so he thinks. One crisis a She found the perfect boyfriend in a land of wonder and enchantment. To find him again, Lauren Marriott is going back to the mysterious world of Terratir, but instead of being a dream come true, it turns into a nightmare of demonic proportions. Zach Marriott will now take his rightful place as the last and only Ancient in the land of Terratir… or so he thinks. One crisis after another threatens to distract him. Will he be able to save himself, let alone the magical realm he has come to love? 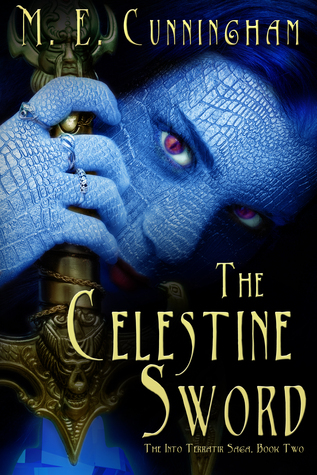 To ask other readers questions about The Celestine Sword, please sign up. What the hell kind of ending was that!?!? Will there be a third book? I actually got to read an advanced copy a few weeks before this book was released. Where to start.. Well.. this book definitely draws the reader in from page one. The book was even better because the characters are more developed and their lives in the world of Terratir have more of an impact. For more then a year Zach and Lauren are back in their own world. Both of them have changed greatly from their first jump into the world of Terratir. Lauren especially is having a hard time adjusting from be I actually got to read an advanced copy a few weeks before this book was released. For more then a year Zach and Lauren are back in their own world. Both of them have changed greatly from their first jump into the world of Terratir. Lauren especially is having a hard time adjusting from being away from the man she loves. No one believes what happened to her and her brother and she has been trying to do everything to go back. Eventually her and Zach were brought back to continue their quest. Loved this book. Devoured it in almost one day. It is a continuation of a magical saga about a girl and her brother who get transported to the world of a video game. Only this time, the brother's best friend and the silbings' mom comes along for the ride. Plenty of action, lots of twists and turns. I am passing it along to both my older kiddos. I know they will love it. Such a great job. Can't wait for number 3! Pen name of Melissa J. Cunningham.